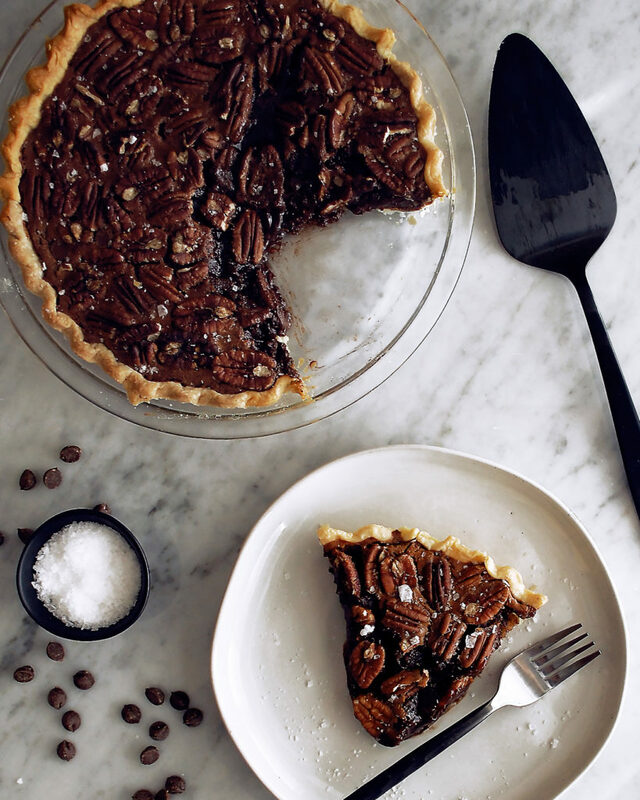 This is definitely not your average pecan pie… it’s a Salted Molten Chocolate Raspberry Pecan Pie that is absolutely perfect to serve as your Christmas dessert. I actually made this pie a while ago, and am just finally getting around to posting it! 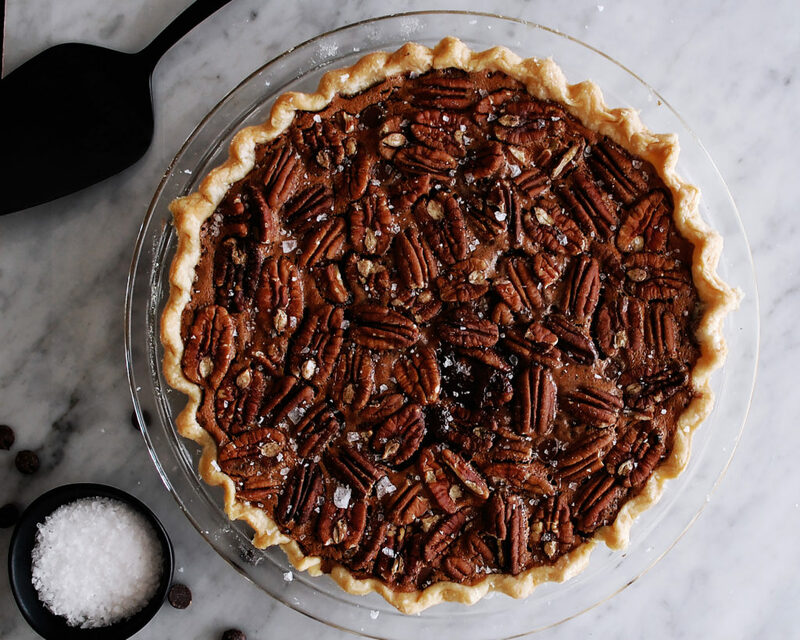 I am honestly so excited about it because I realized this pecan pie is perfect for Christmas. 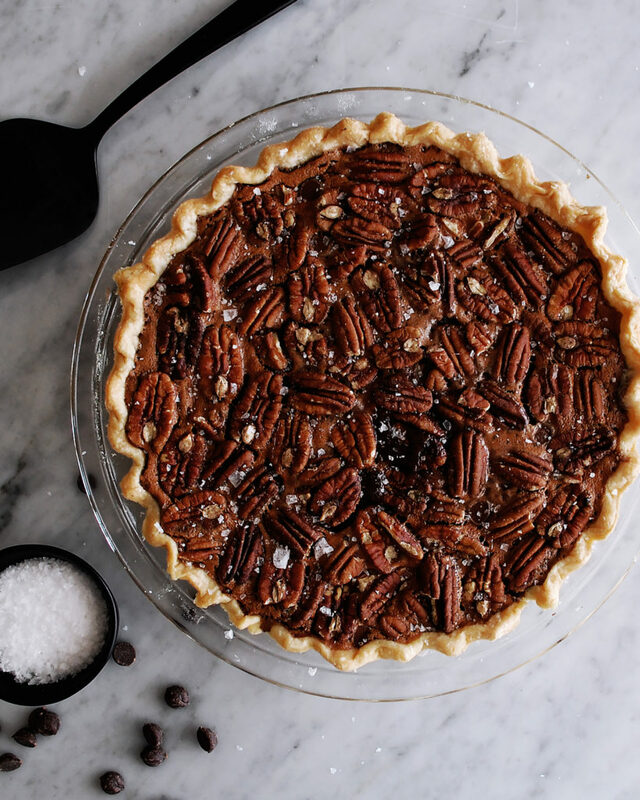 Most people already love regular pecan pie, but I wanted to try something different. I added lots of chocolate, a little raspberry jam for fruity sweetness, and some flaky sea salt on top. Once baked, the pie sets up slightly, but the best part is that it actually stays gooey and decadent in the middle. 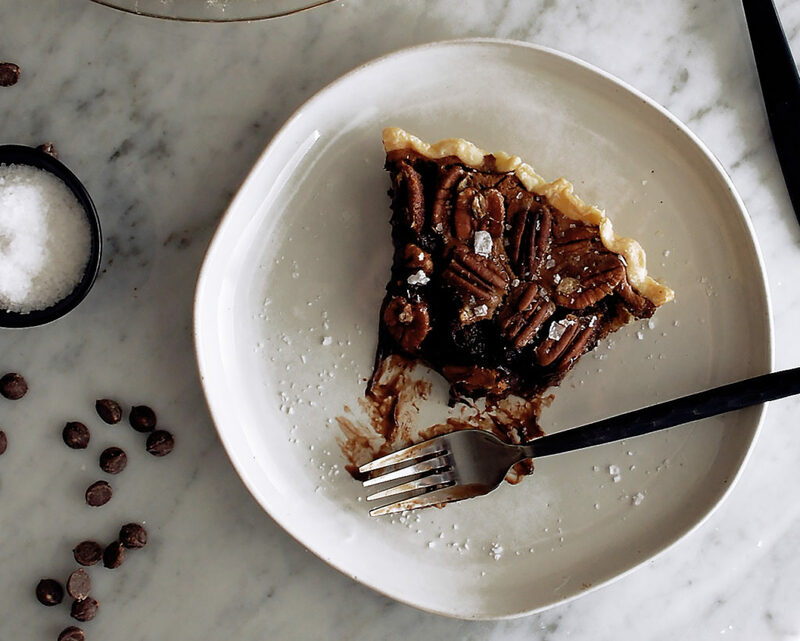 The chocolate melts into the pie and creates almost like a molten center. It is so good. And I think these flavors (especially with the raspberry jam) are so perfect for Christmas!! I can’t wait for you to try it. By the way…if you’re intimidated by making homemade pie dough, don’t be! 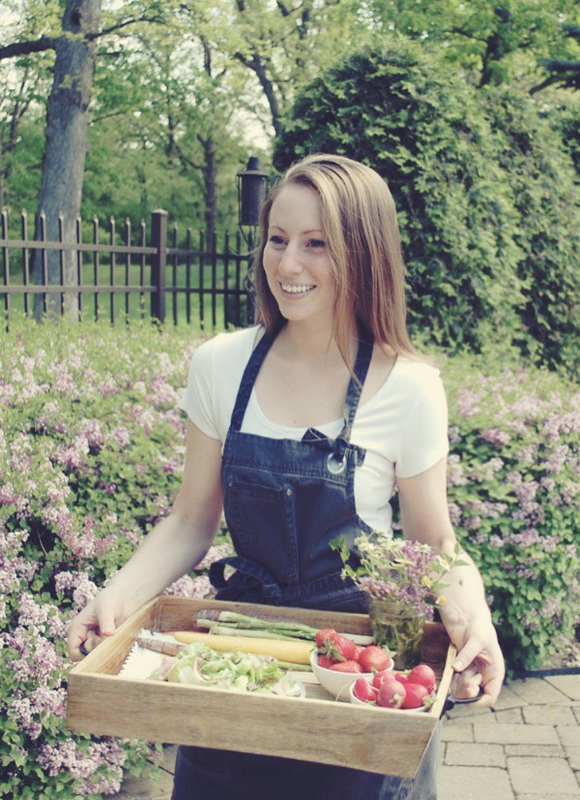 This recipe works every time and it is extremely simple. All the ingredients go into a food processor, gets pulsed into a dough, chilled for 1 hour, rolled out, and it’s ready to go! I am definitely going to have this on my holiday table, maybe with these pistachio shortbread cookie sandwiches as well! In a food processor, combine the flour and salt. Pulse until incorporated. Add the cold butter. Process until the mixture resembles fine crumbs. Add all of the water at once and continue to process. Once the dough pulls away from the sides, it’s ready. Turn the dough ball out onto a floured surface and shape it into a ball. Cover the dough ball tightly with plastic wrap and chill for 1 hour. Preheat the oven to 375°F. Grease an 8” pie pan with butter and set aside. Unwrap the dough ball and turn it out onto a floured surface. Roll the dough (it may need to temper for about 5 minutes so it can roll easier) into a circle about 1/8” thick. The circle should be larger than the pie pan. Gently lay the dough into the pie pan, making sure to press the dough into the creases of the pan. Trim the dough around the sides so that only ½” of dough hangs over the pan. Use your fingers to crimp the edges. Use a fork to dock the bottom of the dough (this allows steam to escape while baking). Cut a piece of parchment paper into a circle, just about the size of the entire pie pan. Lay the parchment paper lightly on top of the dough. Add pie weights to the pan (rice, beans, etc. will work). Par-bake the crust for 10 minutes. Remove the pie weights and parchment paper. Meanwhile, combine the butter and chocolate chips in a small saucepan. Let the mixture melt over low heat, stirring often. Once both the butter and chocolate are melted and smooth, turn off the heat. In a large mixing bowl, beat the eggs, whisking until they’re thick and pale in color. Add the brown sugar and whisk well. Add the cocoa powder, corn syrup, raspberry jam, salt, and melted chocolate mixture. Whisk well until all the ingredients are fully incorporated. Pour the filling into the par-baked pie crust. Top the filling with the second batch of chocolate chips and the pecans, evenly dispersing both across the top. Bake the pie for 45 minutes until set. 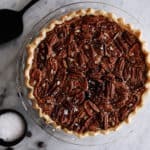 Let the pie cool slightly. The inside should be molten and gooey with chocolate. Serve warm or at room temperature.